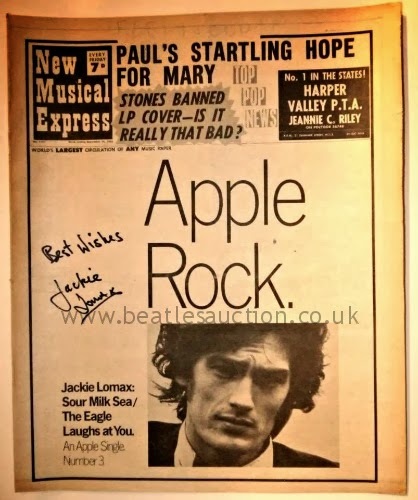 Jackie Lomax signature on a copy of NME featuring an advert for the Sour Milk Sea single on the cover. The 2014 Liverpool Beatles Auction takes place on 23rd August 2014 at the Paul McCartney Auditorium at The Liverpool Institute for the Performing Arts. Items are being taken in for this year's event at The Beatles Shop on Mathew Street. Please check the contact page for details of how to get in touch with us regarding valuations of any items you may have and the availability of our valuer. All valuations are free.